This section provides an overview of the rebilling options in OnTarget. 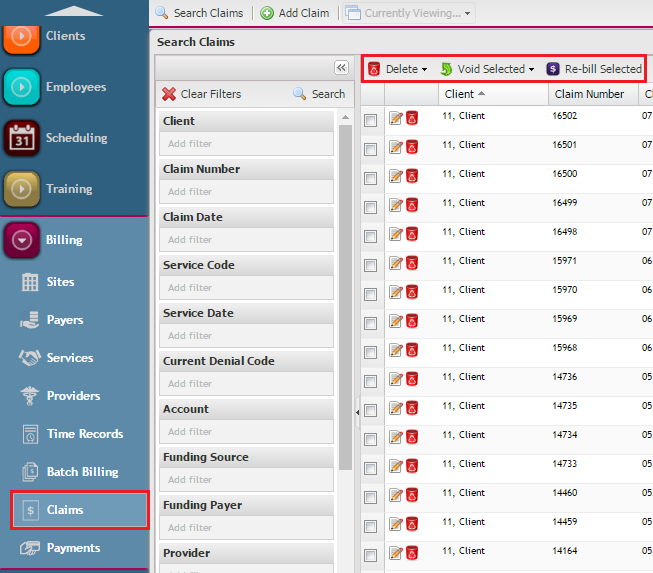 All of these options are found in the Claims desktop, found under the Billing category. There are three main functions to be aware of when it comes to managing and rebilling claims. 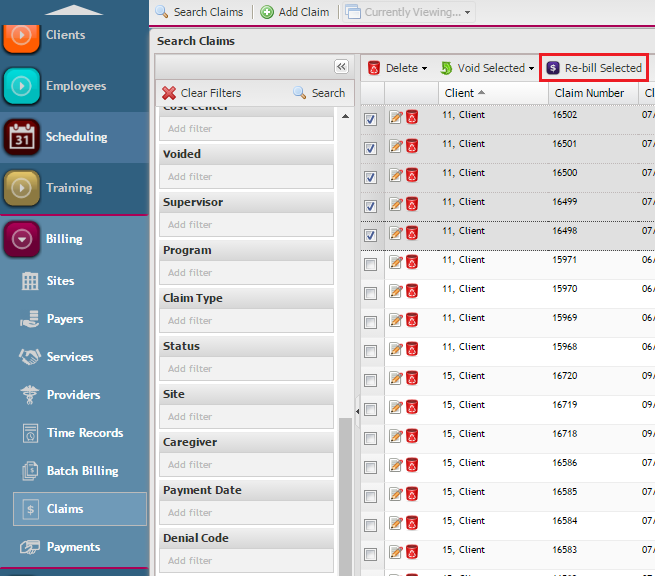 These are all found in the Search Claims grid form; which is the default screen when clicking on Claims. These options are Delete Selected, Void Selected, and Re-bill Selected. The delete option is typically used when a claim needs to be removed so that it is not submitted to the payer. The only claims that are eligible to delete are un-exported claims, which means they have not yet been exported and submitted to the payer. To find un-exported claims, use the Status filter. You can further refine your search using any other pertinent filter. Deleting is the best option when reviewing claims prior to submission to the payers. Some common errors that are caught are wrong authorizing payers or funding payers on the claims, along with incorrect sites. When this is caught, the affected claims should be deleted so that the claims do not get sent to the wrong payer or with the wrong information. Correcting the claims depends on the nature of the error. If the funding payer or insurance info is what needs to be corrected, then the update should be made in the client's insurance record. If the authorizing payer or site information is what needs to be corrected, then the service authorizations should be updated. Any time an authorization is corrected, then the affected time records must also be updated. That is done in the Time Records search grid by find the dates of service and then one by one opening them up to point them to the new service. The time records can then be batched and re-invoiced for submission. 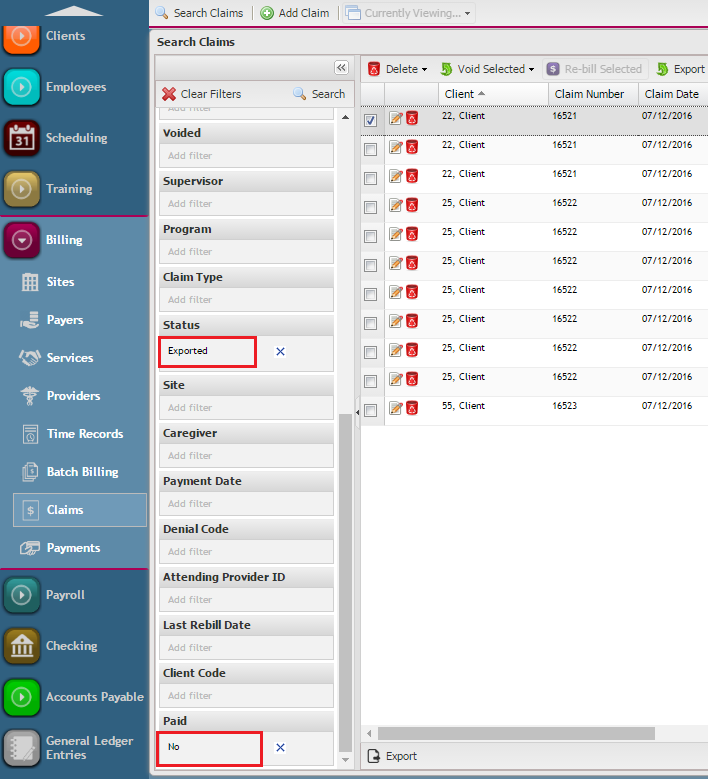 Claims can be deleted for all line items in the search grid, or by choosing lines individually and deleting from selected. Once claims have been exported, regardless of whether or not they’ve actually been submitted to the payer, they can no longer be deleted. In this case, voiding or re-billing are options. This section will focus on voiding and the various options. First, change the status filter to exported since un-exported claims are not eligible for voiding. The other typical filters for efficient searching when voiding would be client, claim number, service date, and/or claim date since known denial information is likely available. The Paid filter will also be helpful to ensure that you are searching for strictly unpaid claims. A claim must be selected in order to see the Void options. Note: multiple lines can be selected by clicking on the first line, holding SHIFT, then clicking the last line to select all claims in that range, OR clicking the first line, and holding CTRL to select only certain claims or lines. Note: when selecting one line, if there are multiple dates of service associated with that claim number, then all of the lines within that claim number will get voided. All voiding affects ALL dates of service on an invoice. Void Only is used to void an existing exported claim where all lines on that claim are NOT paid. This has now freed the time records up to be edited or deleted as necessary. It is important to understand that if the time record is not edited or deleted, then it will be pulled in again with the same claim info the next time any batching of time records takes place. To prevent the same claim that was just voided to go back out to the payer in the same state, the time record will need to be updated by either deleting or editing. If notes are implemented and a note generated that billing, then the note should be updated rather than the time record to ensure they match. To do so, delete the time record and then once the note has been corrected, the time can be re-imported and billed. It is recommended to let the system run the “Notes Un-approval” functionality in that case, which is mentioned in more detail below. The next option is Void and Notify Payer. This is used to void an existing exported claim where any date of service on the claim has paid. In addition to voiding the claim, this option notifies the payer to recoup the funds paid on the whole claim. This function requires a reference number (also called a claim header ID number, the DCN number, ICN number, TCN number, or claim number depending on the payer). This is the main difference from the Void Only option. Void and Notify is only used when there is a payment applied to any date on a claim that needs to be rebilled. To void a claim using the Void and Notify Payer option, filter claims grid using all appropriate filters and select the lines that need to be voided and paid back. Again, please note that on multiple date claims, no matter what is selected, the WHOLE invoice will be voided. It is important to be aware of the payer’s timely filing limits, and that ALL of the dates of service on the original claim will be paid back when using this function. 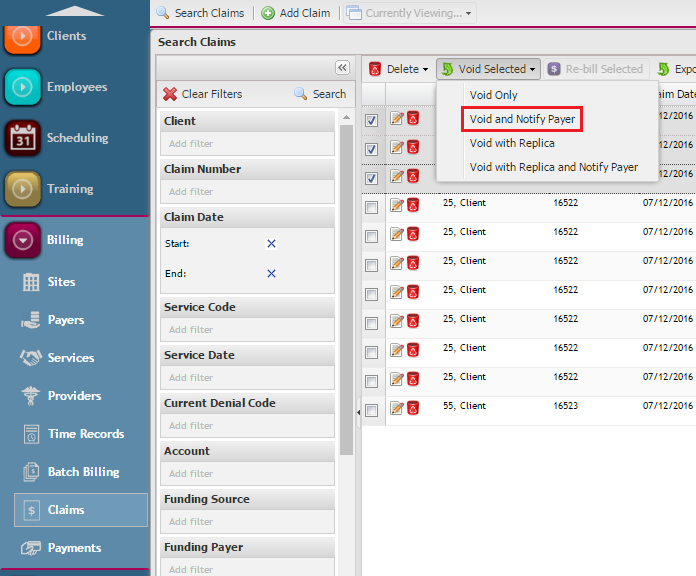 Once claims are selected, Click Void Selected from the dropdown, and choose Void and Notify Payer. After successful voiding, the time records can be edited or deleted as necessary (taking into all the consideration discussed under the Void Only option with respect to notes). The next 2 options are Void with Replica and Void with Replica and Notify Payer. 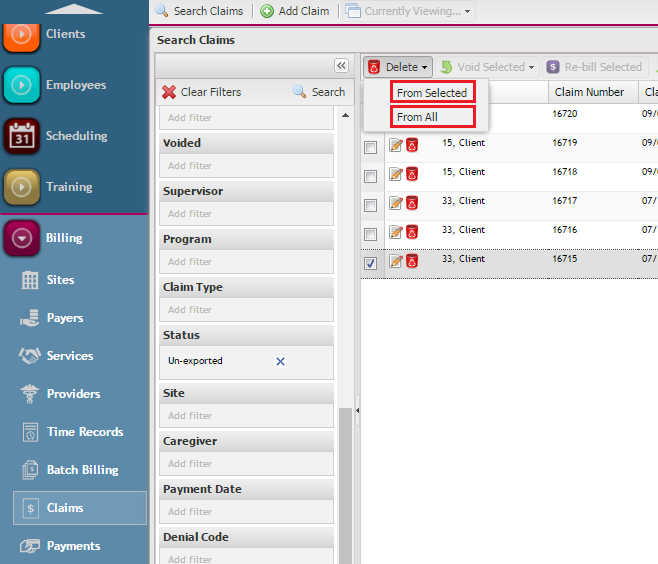 These options create an exact copy of an existing claim that was ORIGINALLY created by adding directly in Batch Billing. Replica rebills are ONLY used when your agency enters claims DIRECTLY into batch billing. In that case, no notes, caregivers, or time records are associated with the claim. Check to see whether or not a caregiver is associated by reviewing the caregiver column. If a name is here, Void w/ Replica is NOT an option. For these reasons, this option is rarely used. 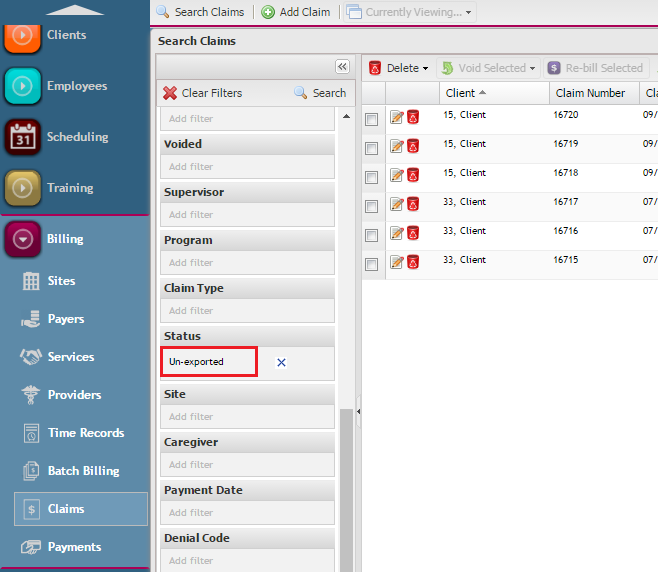 To process, select the appropriate invoices in the Claims Grid, and click Void with Replica. Choose the Notify Payer option in the event there was any payment. Replica rebills cannot be selected for any other billing. If changes are needed to billing that was entered directly in batch billing records, use the VOID only option, which removes the billing from the system. New records can then be re-entered into batch billing in the event corrections to the client or service authorization had to be made. A very important final note before moving on…if a claim needs to be voided and the origination of the billed service is from a note, allow the OnTarget “notes un-approval” functionality to process the void by “zeroing out” or editing the corresponding note. Notes that are “zeroed out” are given the same start and end time by the caregiver. Once a “zeroed” note is re-signed by the caregiver, re-approved by the supervisor, and re-imported, a void of the corresponding claim is automatically generated by the system and if a payment has been made on the claim, a notification will be sent for the payer to recoup the funds paid on the whole claim. This process only works if “notes unapproval” is enabled for the corresponding payer. The note is only "zeroed out" when the money needs to be sent back. The note can also be edited so that a replacement claim goes out and the correct info submitted. 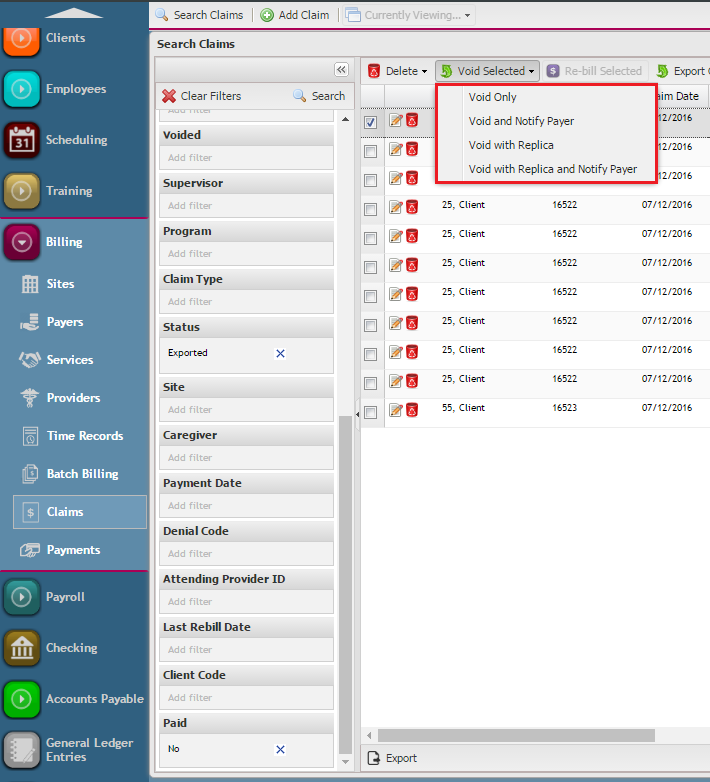 This is a very unique and powerful feature of OnTarget as it automates the reconciliation of notes and billing, along with payroll too. Last is the Re-bill option. This is an option that does two different functions based on whether the claim is PAID or UNPAID. It voids all original invoices associated with the date of service in question, and creates a new or replacement invoice with all units aggregated on one invoice, sometimes multiple, if appropriate (the dates rebilled will only be on one invoice when aggregated). After the claims to be rebilled have been selected, using the filters accordingly, click on Re-bill Selected to void the original claims. When all lines on the claims are unpaid, new claims will be created. When any lines on the claims are paid, replacement claims will be created with the original reference number. Common scenarios where the Re-bill Selected option may be used include claims with an incorrect insurance/payer id number, an incorrect service code rate or authorization number, incorrect diagnosis, or other incorrect consumer demographics information. Ensure that any incorrect information has been corrected at the source (such as the client’s insurance record or the service authorization ) prior to completing any re-billing.